The Brooklyn Navy Yard, the popular and colloquial name for the New York Naval Shipyard, was organized in 1801 and is located north of the Manhattan Bridge and in Wallabout Channel at a bend in the East River and was a United States Government Military Installation (Department of the Navy / Department of Defense). 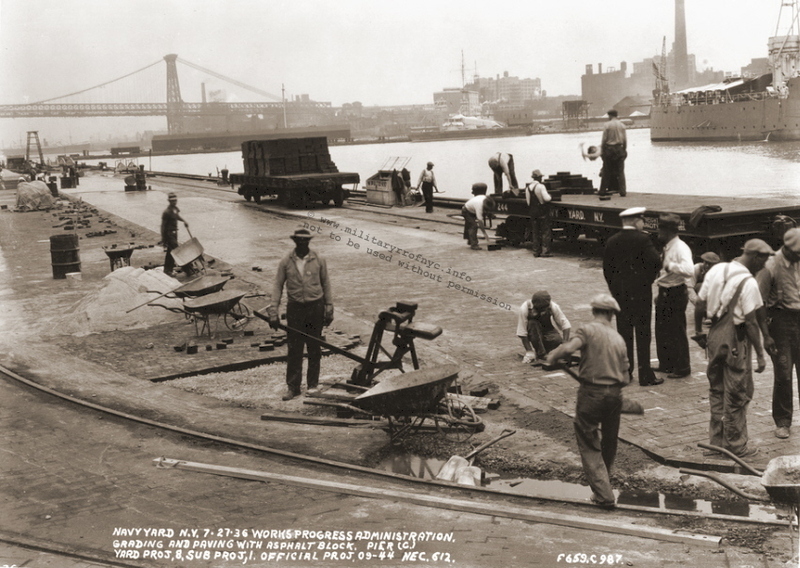 There are many historical and contemporary publications that cover the in-depth history of the Brooklyn Navy Yard, and I leave it to those books to explain that history. 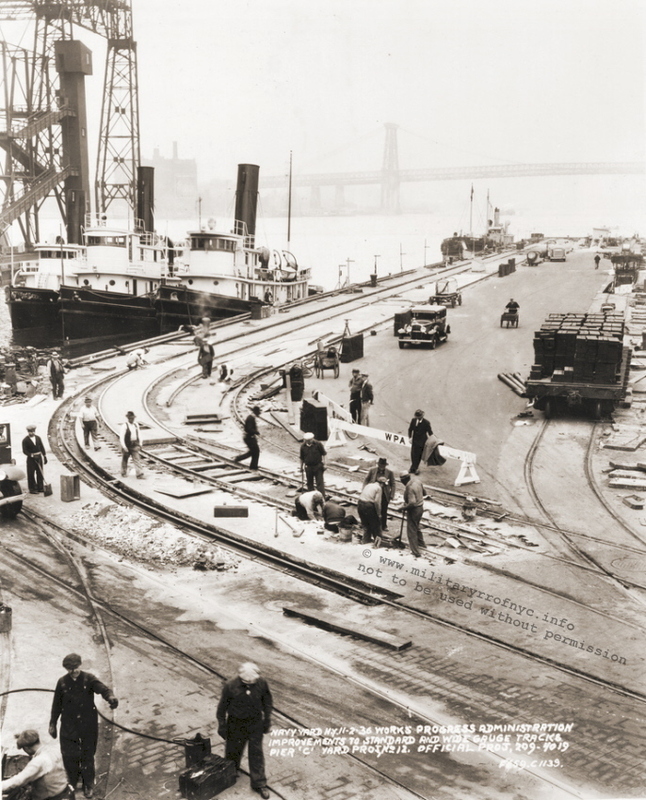 As for rail traffic, the Brooklyn Navy Yard received ship building supplies and coal as well as general freight via carfloat. It would be responsible not only for the hull construction of a vessel, but all the interior spaces as well, which basically means anything that was required in the construction of those vessels, was brought in. 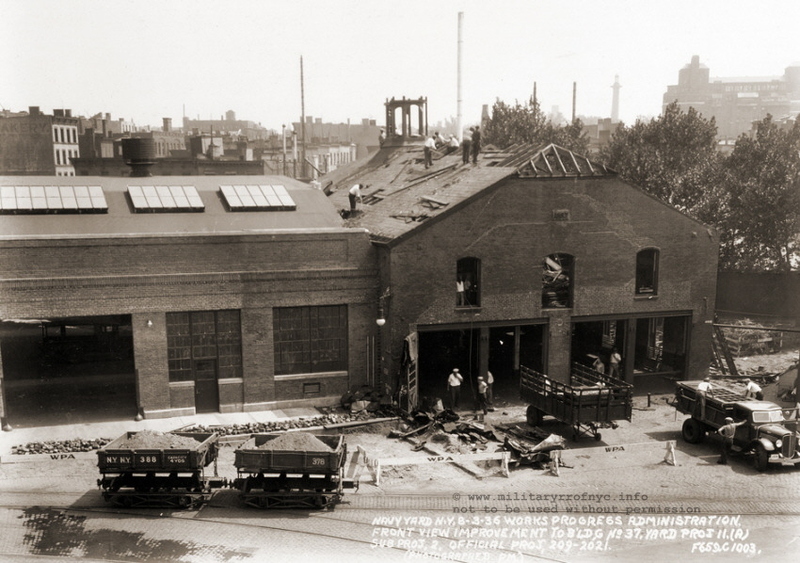 The rail operations of the Brooklyn Navy Yard was sufficiently large enough to have necessitated the construction of a roundhouse with a turntable. Paul Strubeck located the following photographs on the 'net. 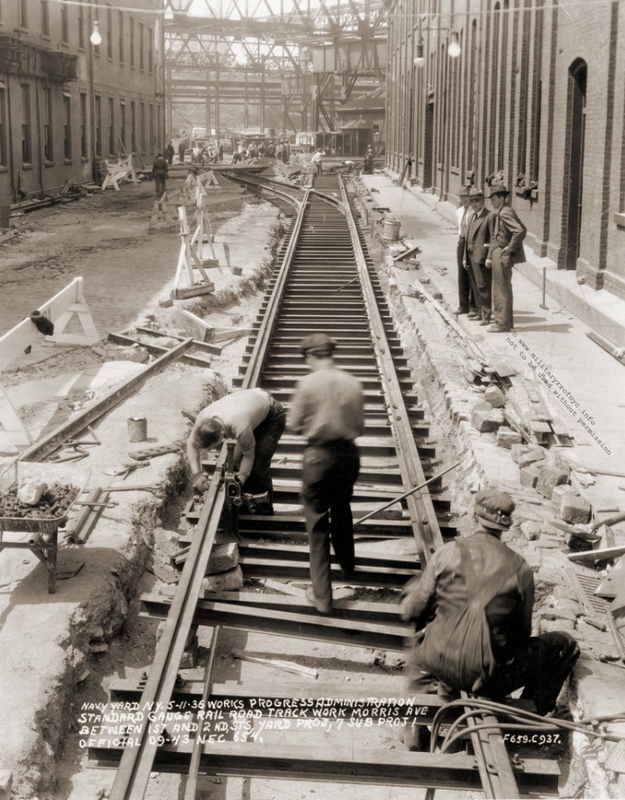 By 1916, the Navy Yard comprised over 255 acres, and would come to have over 30 miles of railroad track. 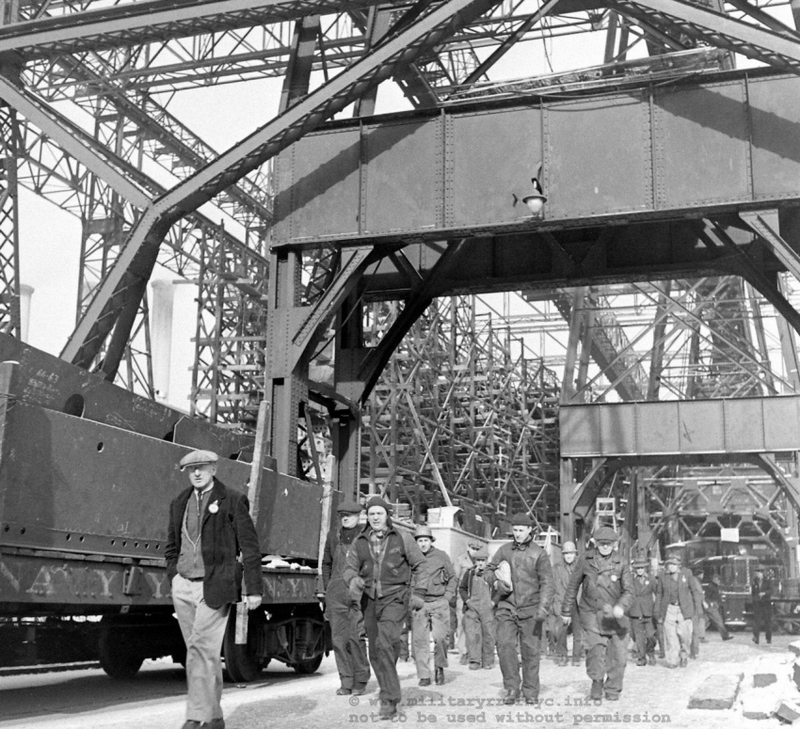 It is unknown at this time if included in this figure is the aggregate total of both the 18 foot and 37 foot gauge trackage for the huge cranes that wound there way around the berths and drydocks, or just the standard gauge trackage. 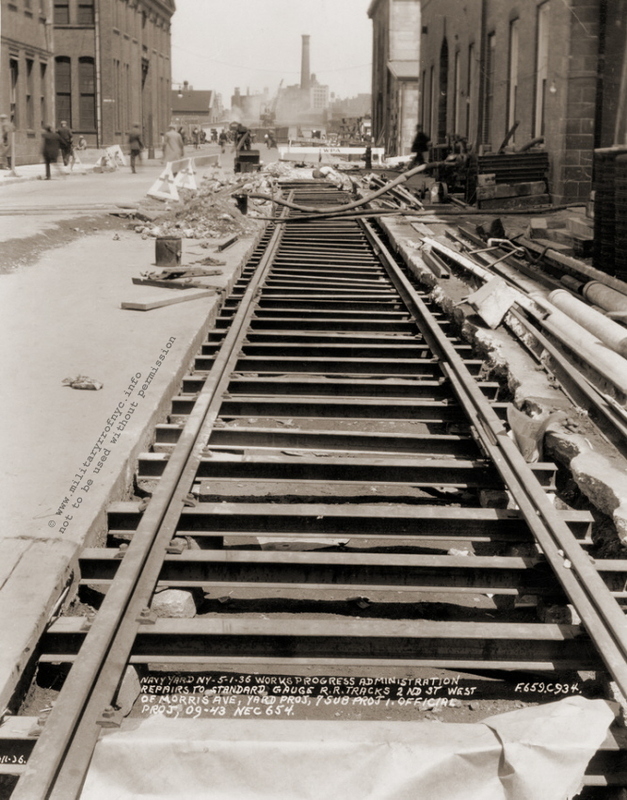 Trackage was upgraded and expanded throughout the years as needed, and many images exist of the track work in progress. Perhaps the greatest recordation of image swas during the period prior to the United States' entrance into World War II. Tom Flagg, graciously allowed the use of the following images ascertained from his research. 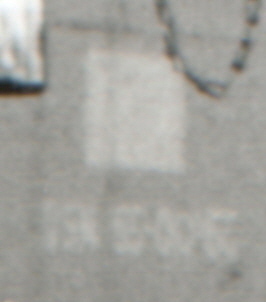 The first appears to be facility map from 1938. 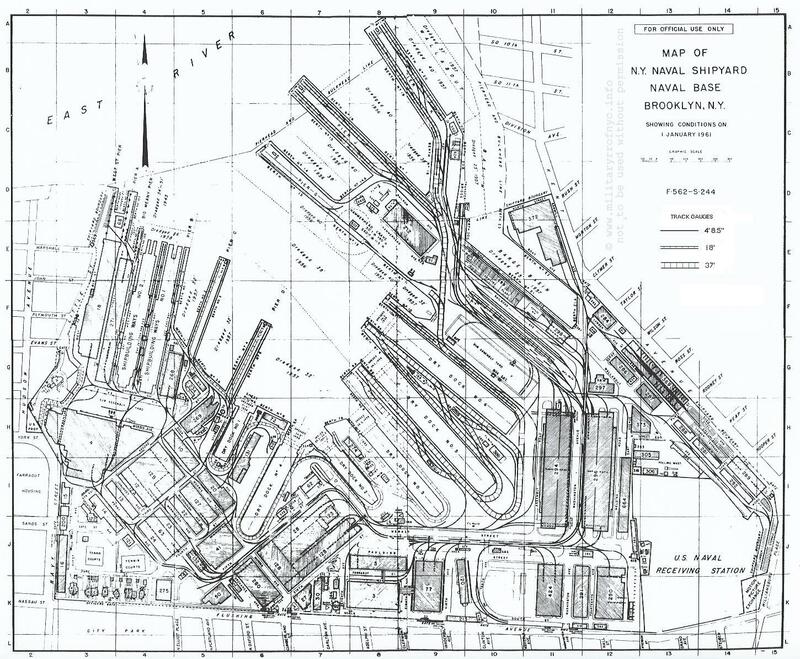 This map is significant as it shows the layout of the Navy Yard and trackage prior to the Navy Yards expansion into the Wallabout Terminal and the original location of the float bridge. Clicking on the map below will take you to a large scan. Please note: Use your back arrow to return you here. This next image is a map of the New York Naval Shipyard dated 1961. Again, please click on the map for a large size graphic with the corresponding key for the building numbers. This next image, is an excerpt from an inspection report and map performed on the the infrastructure within the Navy Yard. This map better shows the relationship of the Brooklyn Navy Yard float bridge to the Brooklyn Eastern District Terminal float bridge, and the interim track connection installed to interchange between the two. Again, click on the image for a large scale scan. Use the back arrow on your browser to return you here. Brooklyn Eastern District Terminal for service to the Wallabout Market Terminal. 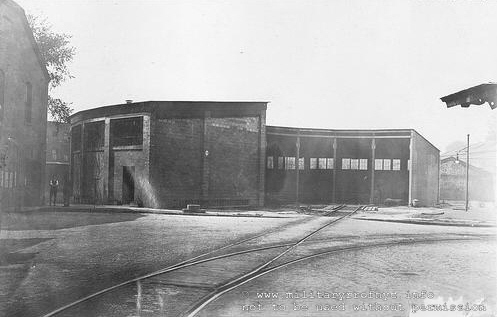 Speaking of the Brooklyn Eastern District Terminal, the US Government would contract with the BEDT to transport carfloats to and from the Navy Yard property after 1940-41, however the Brooklyn Navy Yard would have their own switchers execute switching and car movements within the Navy Yard. 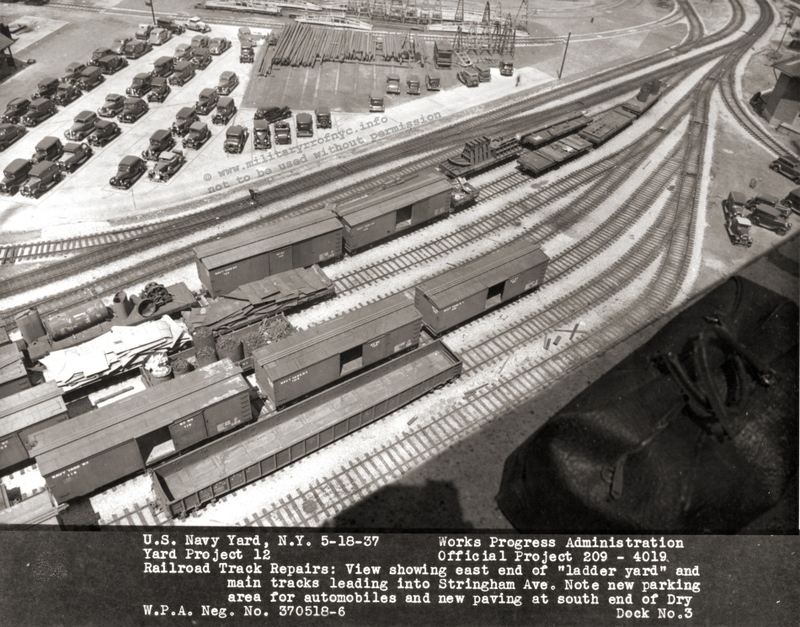 Eventually, BEDT would also go on to take over rail operations within the Navy Yard in the mid 1960's (possibly 1966 when the Brooklyn Navy Yard was transferred from military control to civilian ownership). 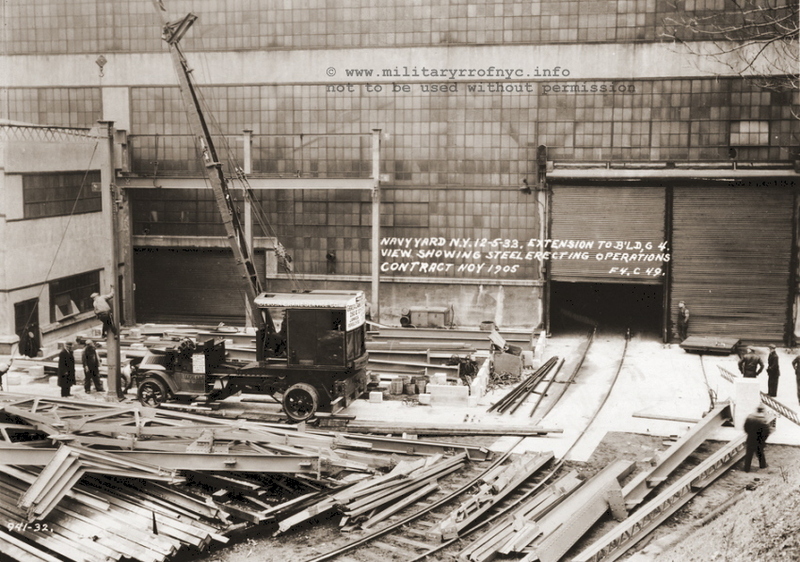 The first float bridge installed at the Brooklyn Navy Yard, was a pontoon supported pony truss with overhead support gantry. 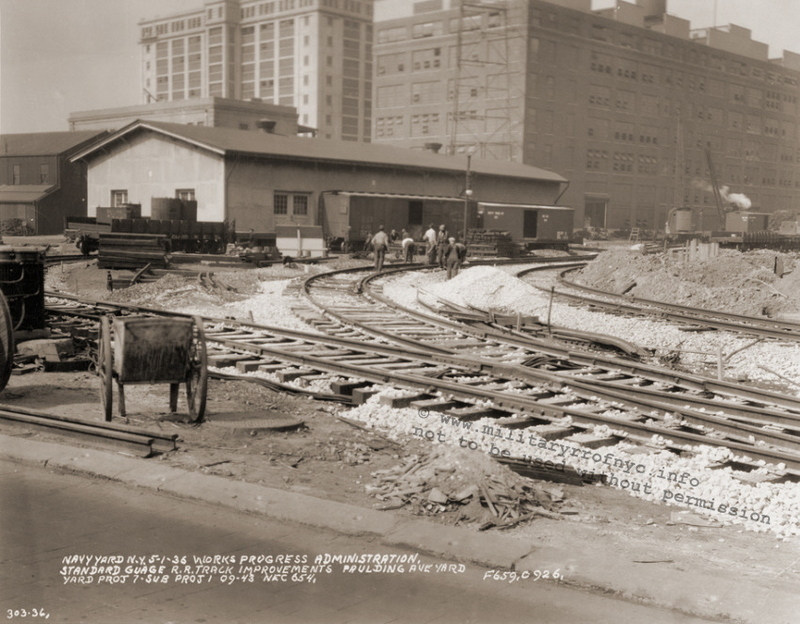 The trestle at right, is for the direct dumping of loose excavation material (sand, stone, etc) into scows for removal. 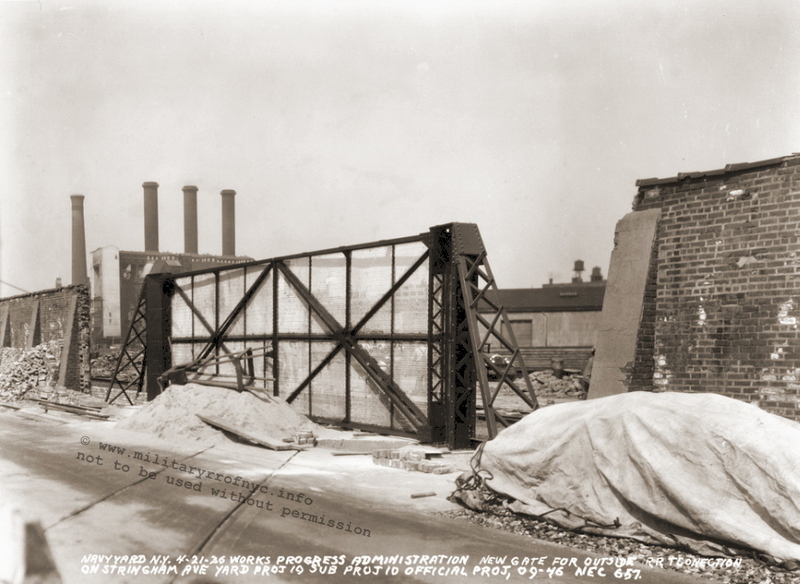 The Brooklyn Eastern District Terminal would install a float bridge of their own to serve their Wallabout Market Terminal, but this float bridge was not located on, but adjacent to the Brooklyn Navy Yard on Clinton Avenue. For more information on this operation click here. This float bridge was modified somewhat in 1983, when the overhead supported dual spans seen in the image above were replaced with a pontoon supported float bridge. Actually, there were two pontoon supported float bridges installed. 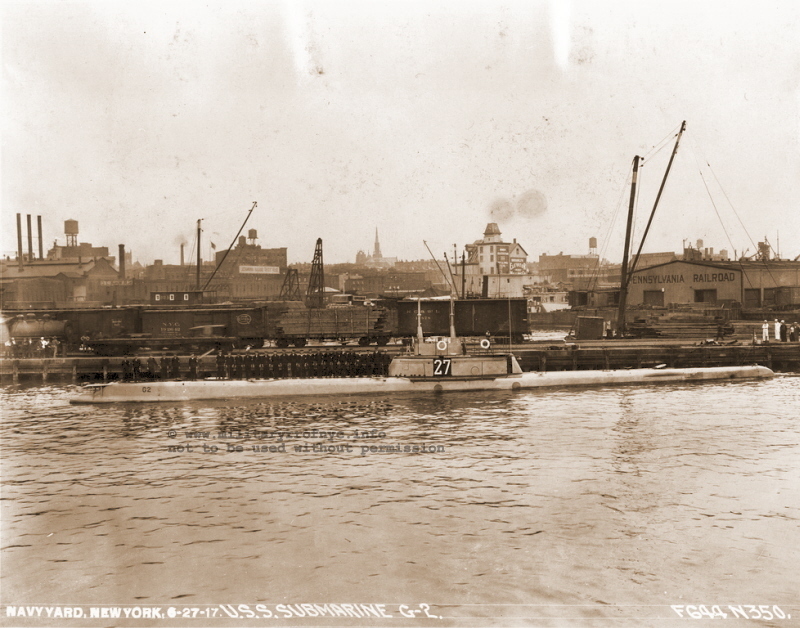 The first pontoon supported float bridge was a through plate girder type, believed to have been floated over from the Delaware, Lackawanna & Western Railroad's Hoboken, NJ facility. However, this float bridge developed an as yet undetermined conflict before being use, necessitating a replacement. It is understood, that the float bridge or pontoon was too wide to between the gantry foundations, but this is unconfirmed. 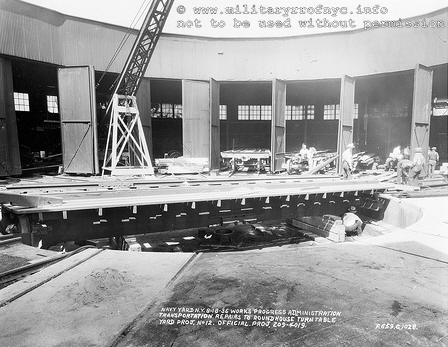 The second pontoon supported float bridge, a pony truss would be installed instead, and the plate girder would be abandoned next to the bulkhead to the left. This pony truss float bridge was taken from the Brooklyn Eastern District Terminal's North 9th Street location, following the closure of that facility in August 1983. This float bridge was last used in 1995 by New York Cross Harbor RR for a subway car rebuilder that located to the Navy Yard. The pony truss float bridge remains in place at this location to this day, although the decking is mostly destroyed, and the pontoon is no longer buoyant. no longer under military control and relinquished to civilian ownership. In October 2013, I received an email from Chip Marshall, who was kind enough to forward several images located in the National Archives, College Park, MD. One of which is Crane #21 lifting a deck gun in 1919! 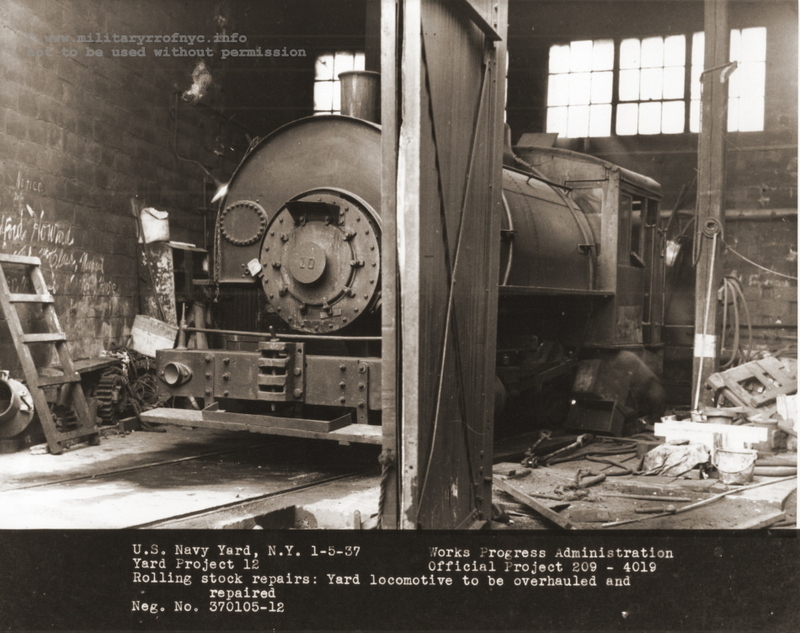 The Brooklyn Navy Yard would come to own many steam locomotives throughout it's history of several different configurations, but unfortunately extremely few photos are known. 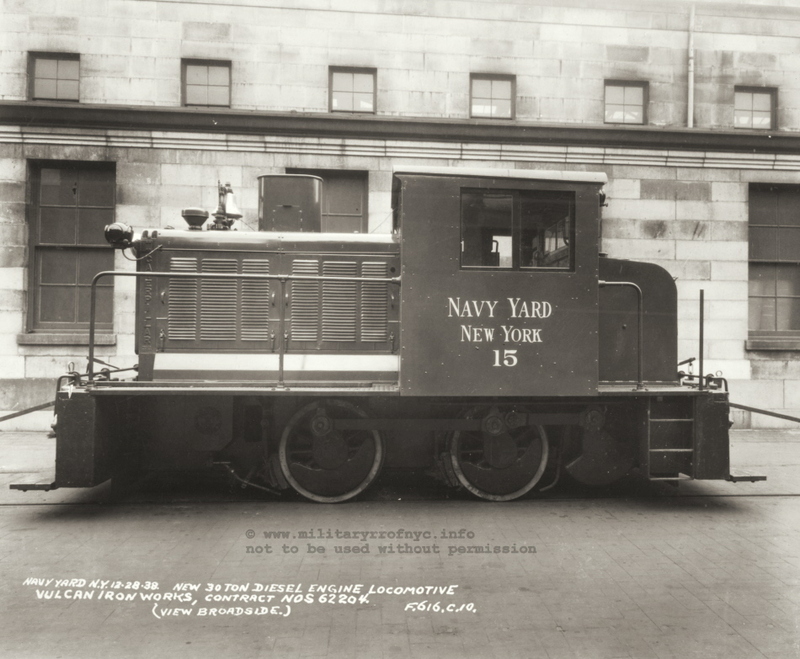 Recently discovered in Lima Locomotive Company builder's records that this author has obtained, Brooklyn Navy Yard at one time; operated a 2 Truck, 25 Ton Shay. 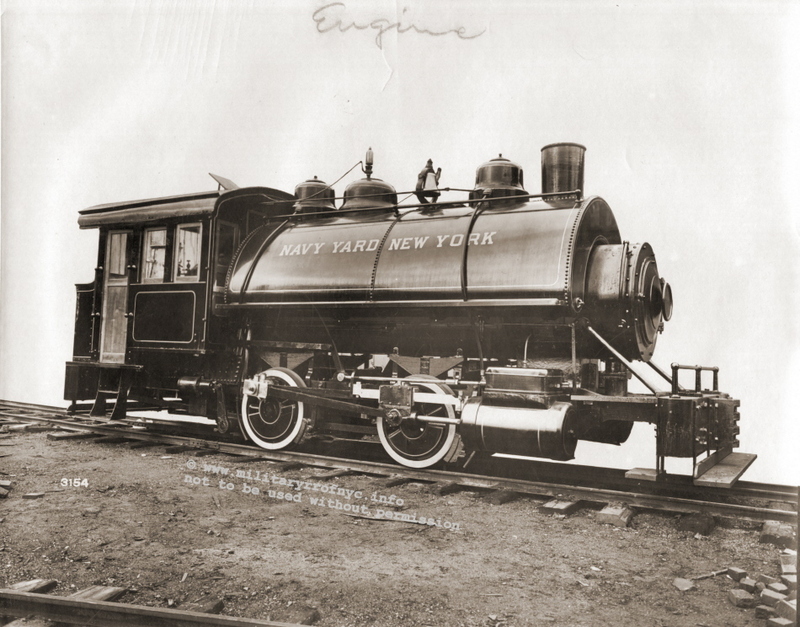 In addition to that Shay, the BNY would operate steam locomotives constructed by Vulcan, H. K. Porter and American Locomotive. 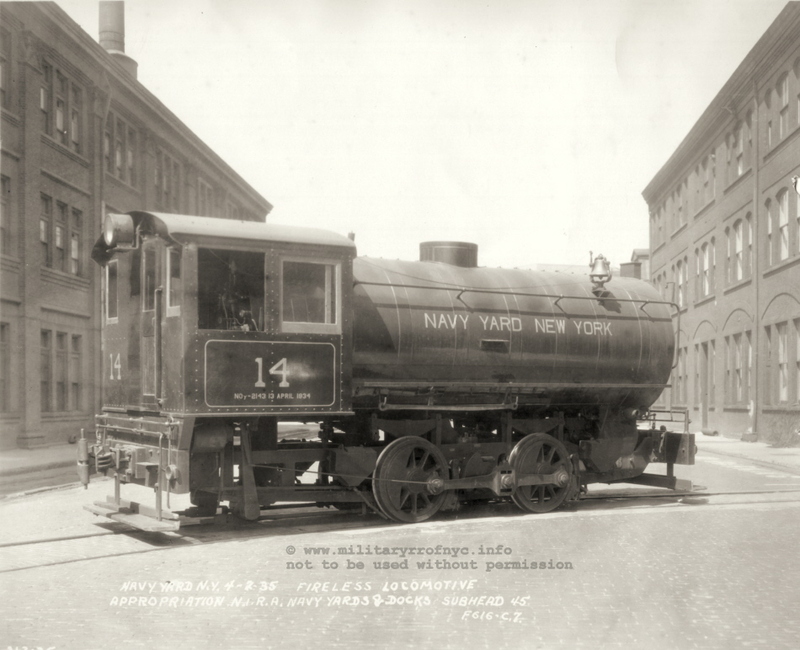 As far as it is known only two of the Brooklyn Navy Yard steam locomotives have survived: #7 and #12. #7 which after serving for the Navy Yard; was employed by American Creosote as their #7 as well. 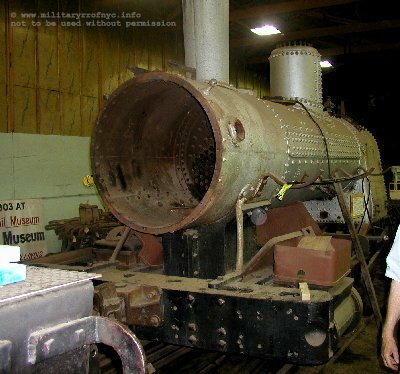 This locomotive is currently under restoration at the Illinois Railroad Museum shops located in Union, Illinois. 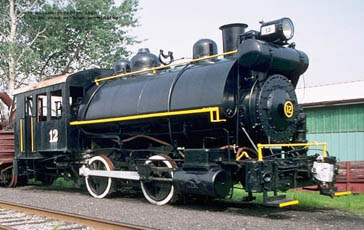 #12 which has been cosmetically restored, currently resides at the Rochester & Genesee Valley Railroad Museum in New York. Please note: This locomotive at R & G V RR is not to be confused with Brooklyn Eastern District Terminal #12, which was thought to have worked at the Brooklyn Navy Yard before being purchased by the Brooklyn Eastern District Terminal. This is incorrect, as BEDT #12 (and #13) worked for the Fleet Supply Base - South Brooklyn Section as #3 and #4, along with two additional identical locomotives #1 and #2. 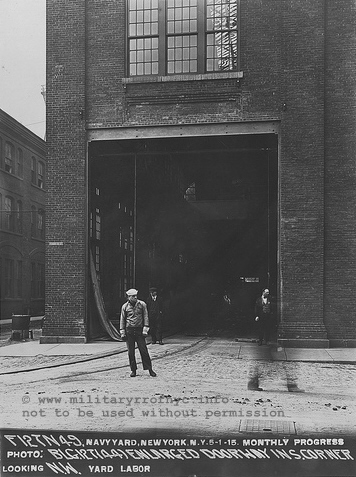 The "Fleet Supply Base - South Brooklyn Section" was a separate military installation, and its history can be read here: Fleet Supply Base - South Brooklyn Section. 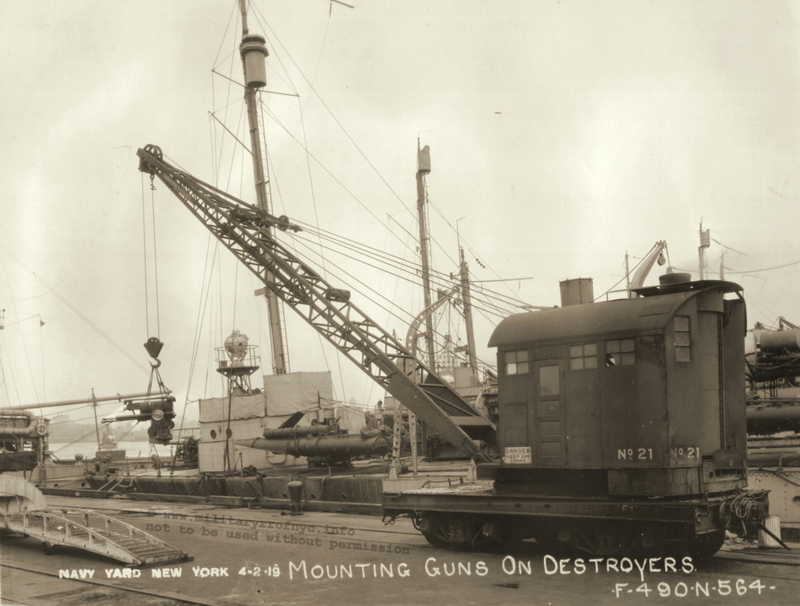 The Brooklyn Navy Yard would dieselize their operations in 1940 through 1944, with the procurement of Vulcan, Atlas and Whitcomb locomotives during those years. 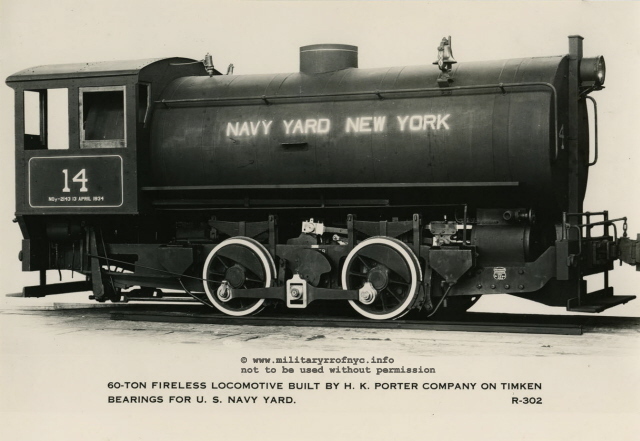 The Atlas locomotives would be surplused in 1948, as would the Whitcombs, being shipped to the Naval Supply Depot in Bayonne, NJ; where they would be put up for sale. Several were purchased by private owners for industrial line use. The Vulcan locomotive which was jack shaft driven, would be used by Lionel as a prototype for an O scale version of this locomotive! 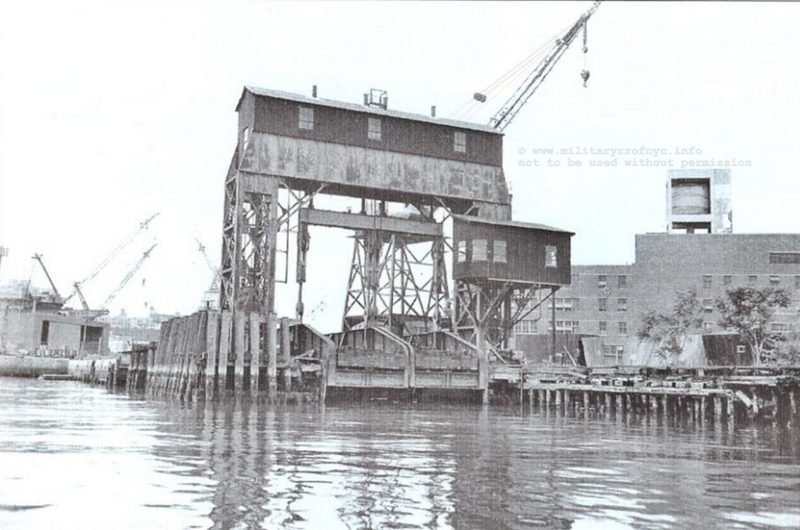 In 1968 through 1981, after the Brooklyn Navy Yard was released from military control; this location would be home to Seatrain Shipbuilding, (see that page on Seatrain Shipbuilding here), which operated General Electric 44 ton locomotives on a portion of the Brooklyn Navy Yard Trackage, and utilized the float bridge. 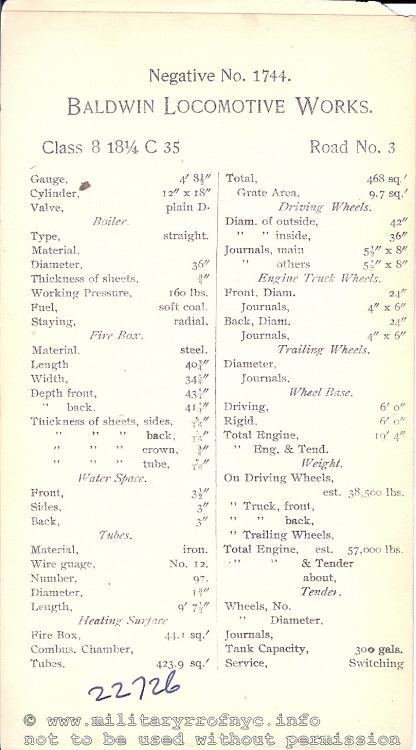 As for the other locomotives listed, unless otherwise stated, their disposition in unknown at this time. 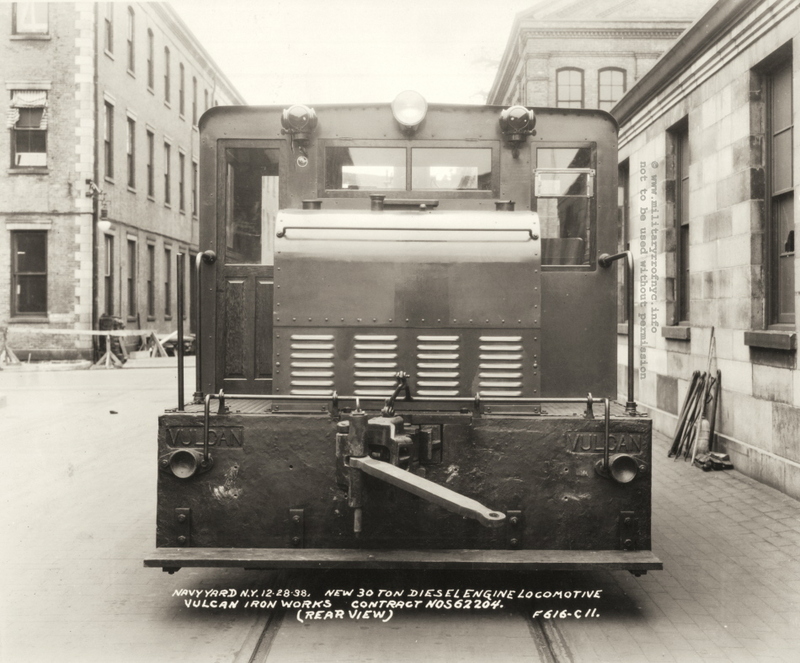 "BNY Railroad: BNY had its own railroad system for hauling heavy material around the yard. 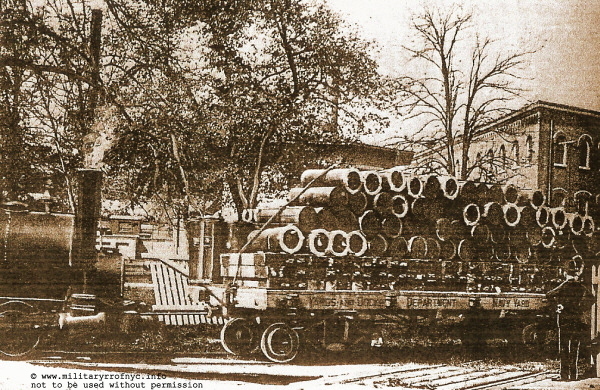 Here one of the yard's trains is returning empty gunpowder canisters to a storehouse in 1904." Working a carfloat at the original float bridge! 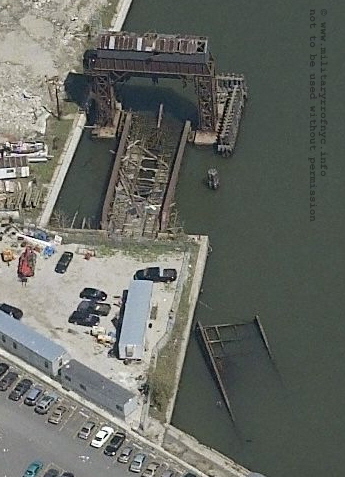 also the Pennsylvania RR Wallabout Station Pier on right side of image. Presumably used to operate indoors and/or hauling munitions / explosives. Note the casting on the front radiator (to right and below front marker lamp): CATERPILLAR! 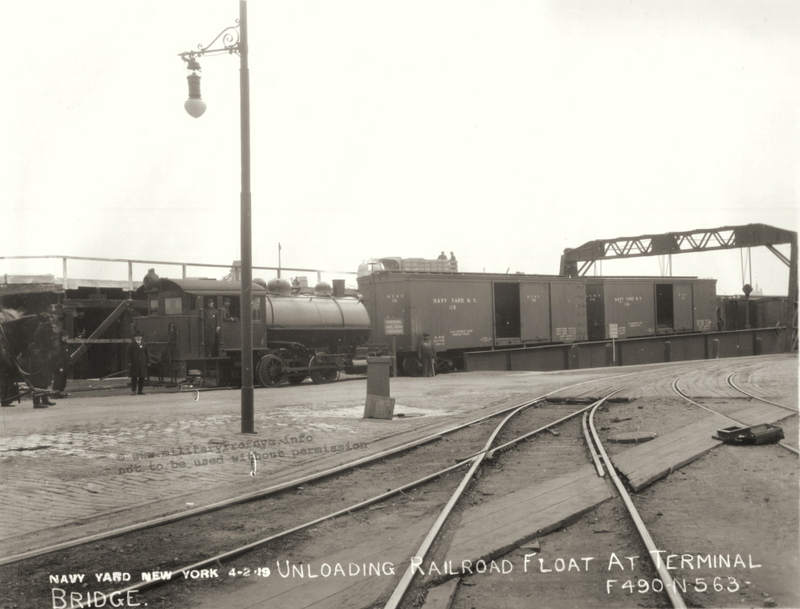 Note the flat car on left and Whitcomb locomotive on right edge. Also, this image as published by Life digital archives was published reversed. Correct orientation shown here. Upon the purchase of several photographs of Brooklyn Eastern District Terminal locomotives, I acquired a series of images taken by Alfred Jaeger. After having placed this dilemma on the back burner for a while; I once again took out my high power loupe and tried to identify this engine again. This time I enlisted the assistance of my good friend and co-author, Paul Strubeck. 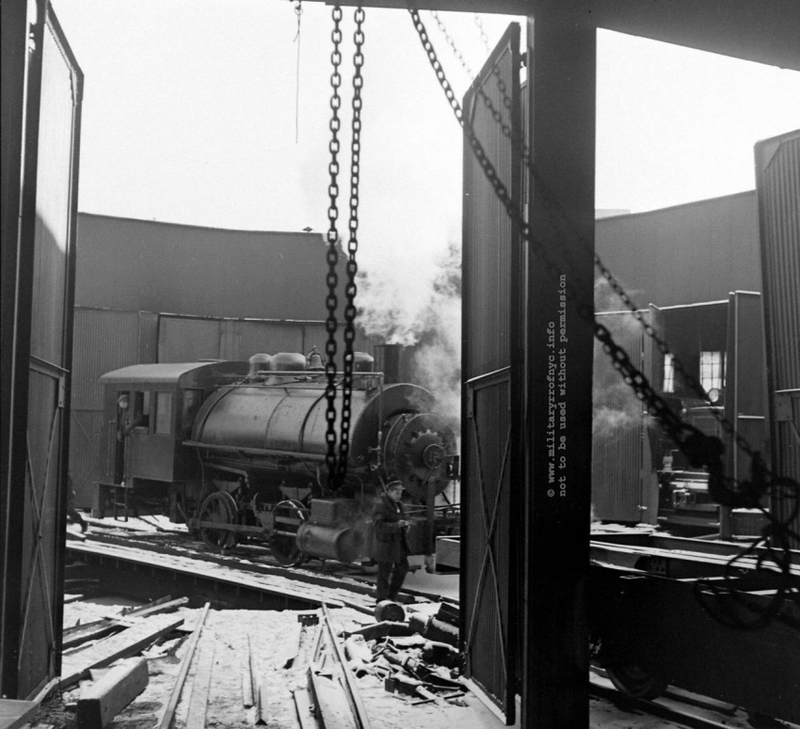 We argued over builders, but eventually discovered it was a Whitcomb locomotive. One of the pictures was at just the right angle (third from left) to show the nose and the Whitcomb name on the front grill. Then inevitably, came more arguing: which model Whitcomb? With many thanks to North East Rails' Whitcomb pages, Paul and I determined this locomotive was either a 45DE27B or a 45DE28. After a little more debating, we finally settled on 45DE27B. 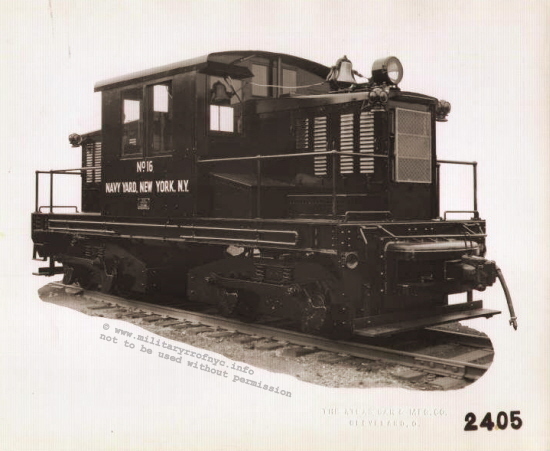 Now for the next argument: who in the New York area would have had a Whitcomb loco? Was it an temporary Bush Terminal, New York Dock, or Bronx Terminal unit? A loaner or demonstrator? Or was it just passing through, being shipped from one place or another? (One thing was sure: it certainly was not a BEDT locomotive!) Then, after Paul Strubeck & I discussed it for about 15-20 minutes... It dawned on us... THE BROOKLYN NAVY YARD. A check of my Whitcomb builders records, showed several Whitcomb Brooklyn Navy Yard entries for both 45DE27B and 45DE28 units. 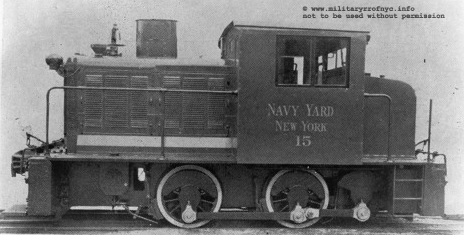 These locomotives was part of multiple orders from the US Navy for Whitcomb units, with other units going to Brooklyn Navy Yard, and the other units going to other Navy Yards & Military Facilities around the US. Then in late 2009, I commenced on rescanning my collection to place larger images on this website. 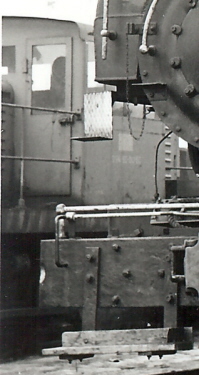 When I got to the one of Alfred Jaeger photos of #16, I realized that the USN Whitcomb locomotive was in one of the photos, and even showed the side of the cab with lettering! This is the right most photo above. The four images above are at different magnification and resolutions, with the last two being the same except for contrast and notation. 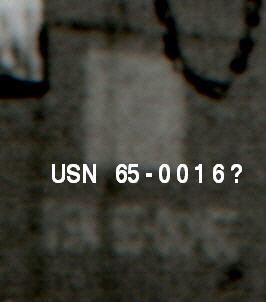 Now, I can definitely make out the USN 65-00. It appears that the bottom half of the 1 is missing, but by the spacing to the next digit, (a 6); it is in fact a 1, making the number 65-0016_. The last number is where the question lies: To me it appears to be a 5 or possibly a 6, making the number 65-00165 or 65-00166. Either of these numbers make this locomotive a 45DE28. If that last number by chance is a 9, then it is a 45DE27B. Now, see that light square above the number? That is the original two digit number painted over. 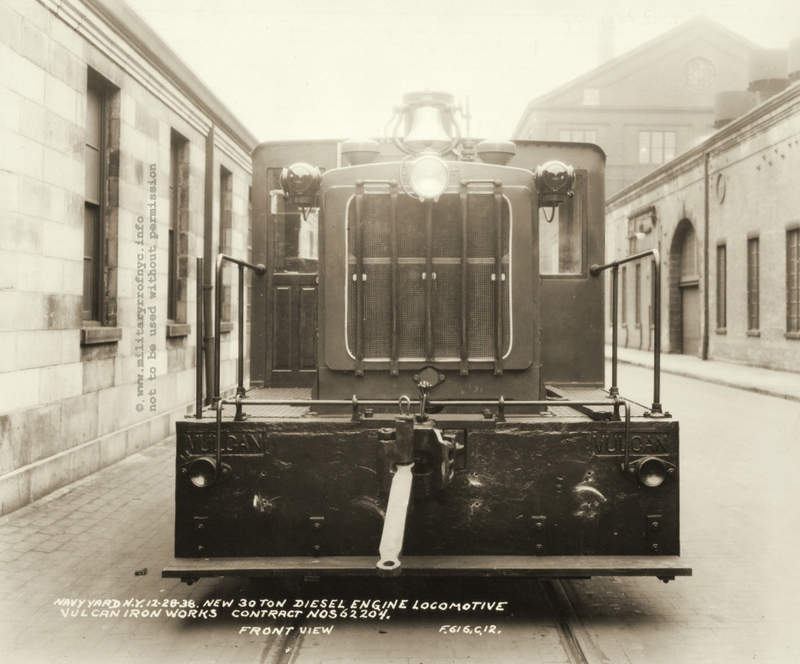 Since only the original order of 45DE28's received the two digit numbers 20, 21, 22; and subsequent locomotives received the 65-00xxx series seven digit numbers, 65-00169 (the 45DE27B) would not have had the original two digit number "painted over". Therefore, I now feel we are looking at either locomotive #20 / 65-00165 or #21 / 65-00166 which are 45DE28. You draw your own conclusion and decide. If any of you out there know the answer to these questions, please... shoot me an email! 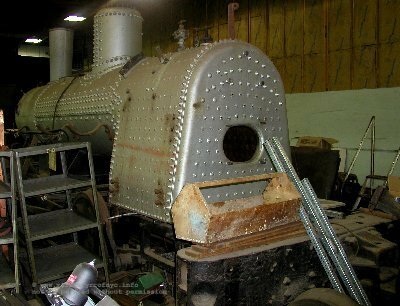 currently at Illinois RR Museum since 1971, under restoration wgt: 78,000 lbs. to Rochester & Genesee Valley RR Museum, on display wgt: 90,000 lbs. 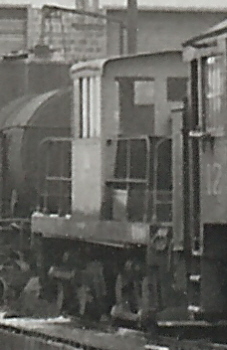 § = The first Vulcan shown; c/n 187, has very little info recorded; however, locomotives preceding it and built after are 0-4-0T, and 36"gauge. I can only hazard a guess that the BNY locomotive was one in that that group of loco built to those specifications. Brooklyn Eastern District Terminal #12 and and #13 (H. K. Porter c/n 6368 and 6369 respectively) were NOT used at the Brooklyn Navy Yard prior to purchase by the Brooklyn Eastern District Terminal, but were in fact used at the Fleet Supply Base - South Brooklyn Section, a separate military installation and were part of a four locomotive order of consecutive construction numbers: 6366, 6367, 6368, 6369 for that installation. Therefore these locomotives are not listed in the roster above. 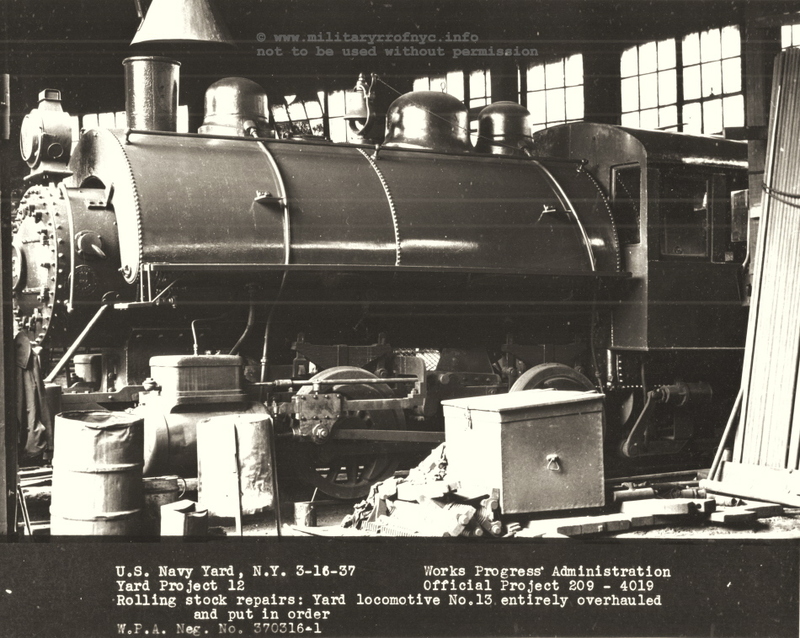 At the current time, disposition of Fleet Supply Base #1 and #2 (H. K. Porter c/n's 6366 and 6367) is unknown at the current time, and information on these locomotives is welcome here. Information, specifications and images may be viewed here: Fleet Supply Base - South Brooklyn Section.